There’s nothing wrong with my old 24″ Samsung monitor, other than it being slightly too small for my current computing needs. I have been using it as my primary display alongside a 23″ Dell display for two years, and before that it sat next to a 19″ display for about four years. But I was feeling constricted by the 24″ monitor and wanted to upgrade to something bigger. After doing some light research I saw that the Dell U2713HM monitor was gaining favor, and going by its specs I felt it to be a good fit for my needs. There were a couple of factors that guided me towards the U2713HM monitor. You can find a 27″ monitor for less than $250 these days, and certainly less than $300. So why did I spend $650-$700 on the Dell U2713HM? For one, a lot of 27″ monitors have 1080P resolution, meaning 1920px x 1080px. My 24″ display is 1920px x 1200px, and my 23″ is 1080P. If I’m going to plop a 27″ monitor on my desk, it had better offer more real estate, meaning that 2560 x 1440 was a must-have. The viewing angles and color uniformity of my 24″ and 23″ monitors are reasonably good, but they’re not great. Vibrancy and contrast could also be improved. I have had good experiences with Dell’s high-end Ultrasharp series before, so I decided to give their U2713HM a try. Note that the U2713HM should not be confused with the wider-gamut U2713H monitor. The HM can display 16.7 million colors and the H 1.07 billion colors. In order to use the U2713HM display at its true resolution, a dual-link DVI cable or DisplayPort must be used. My video card has one DVI-D port, one regular DVI port, and a single DisplayPort. The display can accept VGA and HDMI inputs as well but it won’t operate at its maximum resolution. There are also two USB 3.0 plugs on the right side of the monitor and two at the back, but I opted not to run a USB cable from my computer to activate these ports. I have tested the monitor with a DVI-D cable and DisplayPort, and there doesn’t seem to be a difference in performance. In short, phenomenal. The colors are vibrant, text is crisp and easy to read, and it just looks downright fantastic. After using the monitor for a day I decided to splurge for a second one. The second monitor arrived with either a scratch or line of dead pixels in the panel, so I’m going to either return it for a refund. Maybe it was a piece of fiber caught under the front panel? Random defects like this do happen. Maybe in a month I will try my luck at ordering another monitor, but for the time being I will see if I can make due with the 27″ as my primary display and older 23″ as the secondary. The default brightness makes whites look ultra-white, but it was a bit much to stare at for long times. I dropped it down from 75% to 60%. One thing to note is that, at 2560 x 1440 resolution, everything appears a bit smaller – especially text. From what I could tell thus far, the resulting slight difference in text size is balanced out by the increased sharpness. I am absolutely, definitely pleased with the monitor. It has a smaller footprint than my 24″ Samsung, but appreciably more screen real estate. 3″ diagonally might not seem like a lot, but 2560px is 33% wider than 1920px. The added height is also much appreciated. I highly recommend the U2713HM, and am quite pleased with my purchase. The price does seem a bit high seeing as how there are 27″ monitors that cost less than half as much, but in my opinion it’s well worth the premium. How many windows do I have open at any given time? At any given time I might have open: two photo editors, several (sometimes many) multi-tabbed browser windows, multiple text files, several file folders, an html editor, FTP window, 1-3 email windows, an RSS reader, and maybe MS Word – all at the same time. One more thing to note is that the monitor is compatible with VESA stands. At just under 12.5 lbs for just the panel, you might be able to mount it to single-monitor arms and stands that are designed for smaller monitors. I purchased the first monitor for $630 plus tax from Dell directly, and the second from Amazon for $650. The one from Amazon is being returned because of a slight defect, but I might try ordering another one in a few weeks. The mismatch in display quality between this monitor and my 23″ is very distracting, but I find myself going to the secondary less often than when my primary was a 24″. Thus, a second 27″ might not be the most efficient use of funds, but I will see how I feel in a week or two before I open my wallet again. 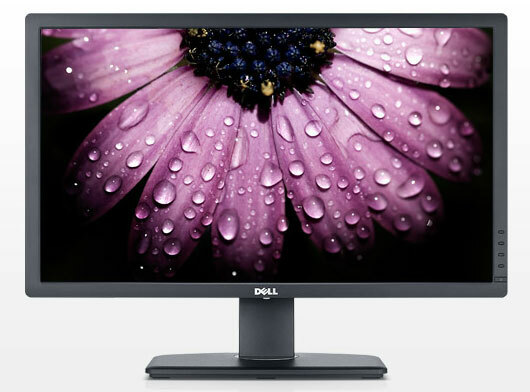 I recently came across a good deal on a used IPS screen Dell Ultrasharp 2408 (1920×1200) that I am thrilled with. I’ve been an afficianado of 1200+ pixel vertical resolution screens since the original 4:3 1600×1200 monitors came out. Anything less and it is hard to fit a Letter/A4 sized document plus window dressing on the screen without scrolling or truncation. Besides pixel height, more pixel width (like Stuart’s new monitor) means more windows on screen at a time. This is essential for content creators (programmers, architects, designers, illustrators), who need to see the requirements, designs, and specs for their projects as well as the creation workspace itself. This is one area where pads cannot complete. “The desktop metaphor works best when the workspace is the size of a desk top”.